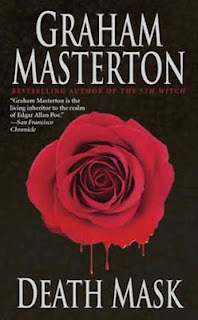 Graham Masterton's Death Mask is the second book in the Sissy Sawyer series. In countries outside of the United States, Death Mask's title is actually The Painted Man. Death Mask is a blood-bath thriller about an ugly, evil killer who appears out of thin air to bludgeon people, most often in elevators (trust Masterton to turn anything into scary). This particular killer is untraceable and non-existent when police and detectives are investigating murder scenes, which indicates that this killer is either really good, or just a ghost. In another part of the city, a young artist named Molly discovers she possesses the gift to paint pictures that come to life (in other words, if you want a vase of roses, Molly can paint the roses to make them appear out of thin air). After the murderer wearing the "death mask" begins his killing spree, Molly is contacted by the police to sketch an image of the killer based on the description of a wounded victim. Of course, since Molly's paintings come to life, she is cloning additional killers each time she makes a sketch. In an effort to catch and kill the multiple "Death Mask" killers, Molly works together with her husband Trevor, his psychic tarot-reading mother Sissy Sawyer, and a few fearless detectives to stop the murders for good. As with all of Masterton's novels, Death Mask is completely unpredictable with a unique plot. This novel is surprising, scary, horrifying, gruesome and chock-full of every other element that makes a horror novel an amazing experience. Even the killer's motive is an enigma that will leave readers thinking about Death Mask long after they've finished it. I did get a kick out of Sissy Sawyer and her relationship with her deck of tarot cards. Apparently, Sissy has been carrying her tarot deck around with her for her entire life and has given hundreds of tarot readings, but when she uses the deck to predict the killer's next moves, she is baffled and surprised about some of the cards that turn up because she is unfamiliar with them. How is that possible? I can't remember a time I've ever been disappointed in a novel by Graham Masterton. Even his novels in the crime, mystery, and general fiction genres are excellent, specifically because all of them are unpredictable. Some of his novels have happy endings, and some don't, which makes Masterton that much more fun. Masterton is, without a doubt, one of the best writers of the horror genre. Click on any of the images below to review Graham Masterton's books in more detail on Amazon.com. What are your favorite novels by Graham Masterton? Who is your favorite horror novelist? Share your thoughts with us in the comments section below!